A quick primer on playing Big Shaman in Rise of Shadows. 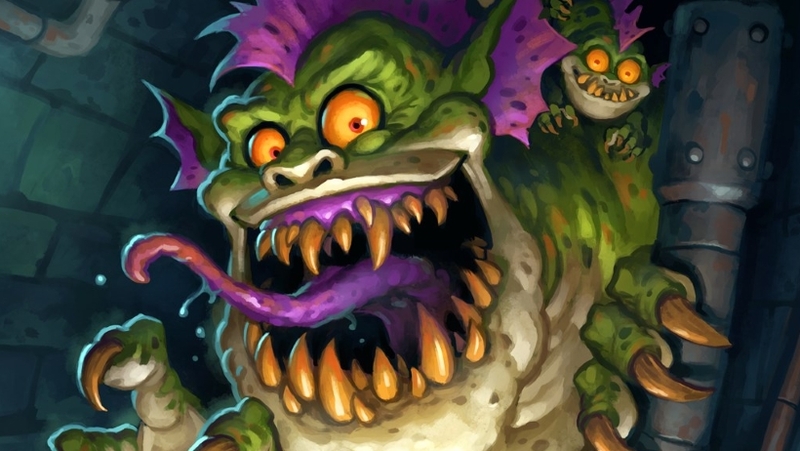 Our Big Shaman deck list guide features the best Rise of Shadows deck list for Season 61 of Hearthstone (April 2019). Our Shaman guide also contains Mulligan advice, card combos and strategy tips. Big Shaman is a Hearthstone deck to land with Rise of Shadows expansion, and takes advantage of the new Epic Muckmorpher card to cause the opponent some serious bother, earlier than they might have been expecting. This allows you to get a copy of cards like Ysera, Al'Akir the Windlord and Walking Fountain onto the board much earlier than usual. You might even get a creature like Big Bad Archmage out into play as well, who himself will summon a mighty minion at the end of each turn. Even though it’s still a very new archetype, it has already proven to be somewhat successful in the new meta with a fairly solid win rate, though obviously the smaller sample size may be leading the results a little. Nevertheless, we’ve put together this Big Shaman guide so you can see how it fares on the ranked ladder for yourself. We’ve got the best deck list being used right now, detailed advice on how to pilot the deck, as well as a breakdown of the all the important cards and combos you need to know about. As we see more results over the coming days we’ll be returning to update this guide with any new info. The aim of Big Shaman is to cheat out a version of your more expensive minions using the new class Epic minion, Muckmorpher. When this terrifying monstrosity enters play it becomes a 4/4 copy of another minion in you deck, which means you can take advantage of some of the powerful abilities on late game cards much earlier and storm into a lead. That’s why cards such as Ysera, Big Bad Archmage and Al’akir the Windlord are included in the list, as bringing any one of those out on turn five represents a major discount. You can then start gathering Dream cards early, summoning more minions onto the board for free, or pushing for damage with Windfury attacks that can set you up to win the game. Early game: As you’re holding out to reach the late game you’ll want to take a control approach in the opening few turns. You can clear away any of your opponent’s early drops using Totemic Smash and Lightning Storm, while prepping for the next phase of the game by drawing cards using Far Sight. Mid game: Big Shaman really comes into its own as you head into the mid game. The card you’re looking for here is Muckmorpher as that can shoot you into a big lead if dropped on curve. Having the effect of a Ysera, Big Bad Archmage or Al’akir the Windlord on the board on turn five is such a huge advantage. You can follow that up on turn six with Eureka! to cheat out more copies of these late game minions onto the board. Before pulling the trigger on these big tempo plays, though, you can look to clear the board on the opponent’s side using Hagatha’s Scheme. If it’s been in your hand since the start of the game it will put out some significant damage. Elsewhere, Rain of Toads can protect your more powerful drops and stall your opponent’s aggression brilliantly. Late game: The fun thing with Big Shaman is that the deck’s late game is essentially a repeat of the mid game. As you’ve only been summoning copies of your high cost minions you’re now in a position where you can play them legitimately, gaining all the advantages and benefits that comes with them once again. If you’re opponent has had to blow all their removal to keep on top of those mighty drops earlier in the game, then they should be out of answers now and you’ll be in a dominating position. 1. Lightning Storm and Hagatha’s Scheme are you big board clears so don’t waste them too early. That’s even more important with the latter as it grows in power with each turn it sits in your hand. 2. If you’ve fallen behind, Rain of Toads is a great way to get back in contention as it represents a significant wall for you opponent to break through. 3. You also get one last late game board clear thanks to Hagatha the Witch, which should be more than enough to clear up any last remaining stragglers. 4. The earlier you can play Muckmorpher, the better, as the powerful minions it replicates will be tough for aggro to deal with effectively. 1. You can use Ancestral Spirit and Big Bad Voodoo to force your opponent to waste their removal cards. 2. When control opponents try to hit you with their biggest minions, ensure you have a Hex ready to nullify it. 3. Far Sight and Haunting Visions are both great ways to get even more of a tempo advantage over control decks along with Muckmorpher. 4. Hagatha’s Scheme may be better as area of effect removal but if it sits in your hand for long enough the damage will continue to grow so it will be able to take out even the largest creatures in control decks – just be careful of hitting your own too! 1. Far Sight: A fine card draw option but its true power lies in the Mana discount it gives that card. If you hit one of your more expensive minions with it you’ll see a serious tempo advantage. 2. Hagatha’s Scheme: You don’t really want to play this early but the longer it’s in your hand the more powerful it becomes. 3. Muckmorpher: As it’s such a vital part of the deck’s power and success you’ll want to hold onto it if you find it during the Mulligan phase. 4. Totemic Smash: Decent early game removal spell that comes with a nice, if not hugely impactful, Overkill effect. - Key targets for Muckmorpher include Ysera, Walking Fountain, Al'Akir the Windlord and Big Bad Archmage. The latter summons a random 6-cost minion at the end of each of your turns. - Eureka! also offers an excellent way to cheat out your biggest minions much earlier than their mana costs should allow you to. You’re looking for the same key targets as Muckmorpher. - Cards like Ancestral Spirit and Big Bad Voodoo can be used to generate even greater value from the high-value minions you've managed to cheat out. - The card you draw with Far Sight will cost three mana less once it's sitting in your hand. In a similar fashion, the spell you play after casting Haunting Visions costs three mana less and you get to discover a spell too. - Each turn Hagatha's Scheme sits in your hand unused it will grow in power by one point of damage. There is no cap on the potential strength of this spell! - Once Hagatha the Witch has been played, all minions on both sides of the board take three points of damage. You also receive a random Shaman spell for each minion you subsequently play. Ancestral Spirit: Ensures your big minions come back even after they’ve been killed once, forcing your opponent to find more removal options. Big Bad Voodoo: Serves a similar purpose to Ancestral Spirit by bringing back more minions for your opponent to deal with although now it’ll be a random one that costs one more mana. Far Sight: Allows you to draw a card from your deck while also giving it a big discount so this is wonderful if it hits one of your big minions. Muckmorpher: This card is the reason for the deck’s existence as it’s the main way to cheat out your late game minions much earlier. Eureka! : Similar to Muckmorpher this spell can get your large creatures onto the board way before their mana cost. Al’Akir the Windlord: A solid target for either Muckmorpher or Eureka! as this minion can have a devastating impact when on the board early. Walking Fountain: There are definitely better minions in the deck you hope will be hit by Muckmorpher or Eureka! but this can still have a significant impact. Ysera: The potential is huge if Ysera comes into play from Muckmorpher as the Dream cards you earn each turn can be more large minions or powerful spells that have a huge effect on the game. Big Bad Archmage: Another prime target for Muckmorpher. If you get this on the board early it represents a massive tempo play that a lot of decks will struggle to recover from.